The winter weather in the Mid-South is never unbroken. It is not uncommon in this region for there to be periodic breaks in the winter weather. A few days ago, snow covered the ground. Then, daytime temperatures rose into the 50s and 60s, allowing the bees to break from their winter cluster and make cleansing flights. Scout bees constantly search for sources of nectar and pollen. Usually the first that they find is skunk cabbage, a plant that often emerges through the snow. Nothing else seems to be in bloom. I have not found any dandelion blooming yet. These hearty wildflowers are the first plants to bloom in great numbers. Still, the warm days give beekeepers a chance to check on the wintering bee colonies. The first check of the year is never a thorough hive inspection, just a check on the status of the hive. Much can be told by watching the entrances to the hives. Healthy hives show much activity. Hives with only a few bees entering and leaving the entrance may be dead colonies that are being robbed of their remaining honey stores. Hives with considerable activity at the entrance, especially guard bees fighting with bees trying to enter, may also be losing honey stores to robbers. My January bee hive check involves lifting the covers and looking for live bees inside the hives. Often the winter cluster of bees is located on the sun-warmed south side of the hive, like the hive shown in today’s photo. With the hive facing east, the cluster is centered over frame positions seven through 10. Next, it is important to check the amount of honey that remains in the hive. This can be done by lifting the rear of the hive. If it feels light, emergency feeding is needed to sustain the bees until dandelions come into bloom. 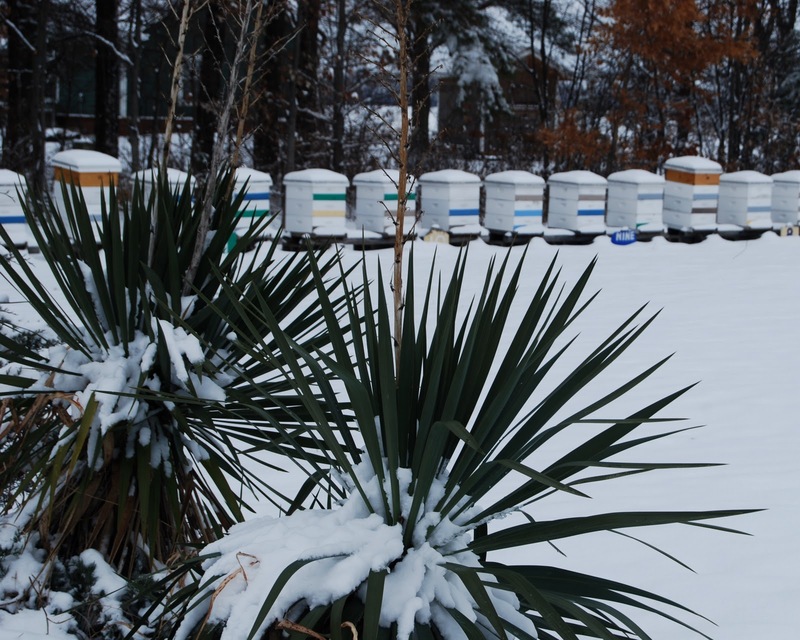 While the warm weather gives both the bees and beekeepers a needed break, precious winter stores are consumed by the bees’ flight. When the Memphis Flyer started 21 years ago as a weekly newspaper, they warned the public to “buckle up.” Few start-up newspapers prove to be as long-lived and sought after as the Flyer. Their success seems to be their astute political reporting and keen sense of the pulse of the city. 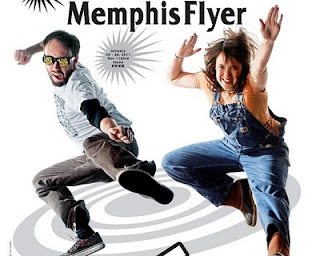 This week’s issue, number 1143, is devoted to “young movers and shakers who will forge Memphis’ future.” Our good friend, Mary Phillips, flies from the cover of the Flyer in blue denim “hog washers” and gum boots, an urban farmer ready to spring into action. Mary worked with Peace Bee Farm to gain experience in beekeeping while she was completing her college studies in sustainable agriculture. Now she manages a vegetable farm in the center of the city. She can be found in Memphis’ Binghamton neighborhood preparing soil, planting seed, tilling, and harvesting vegetables. A farmers market will open in Binghamton in the spring. Other days Mary may be found conducting farm tours for children learning about the source of food. Today, I assisted her assemble bee hives for the urban farm. Mary is helping plan the first Farm to Table Conference for Mid-South Producers, an event planned to bring farmers together to share ideas and build farm marketing strategies. At 23 years of age, Mary will be one of those teaching farmers methods of using social media. Another of Memphis’ energetic young leaders featured in the Flyer is Kat Gordon, the owner of Muddy’s Bake Shop. Kat learned to bake cup cakes from her grandmother, nicknamed Muddy. Memphians eagerly line up for Muddy’s cup cakes deeply covered with frosting of real butter. Kat often serves her cup cakes wearing a bright red wig and dressed as Lucille Ball in I Love Lucy. Read the complete Memphis Flyer article at http://www.memphisflyer.com/memphis/20-30/Content?oid=2562675. 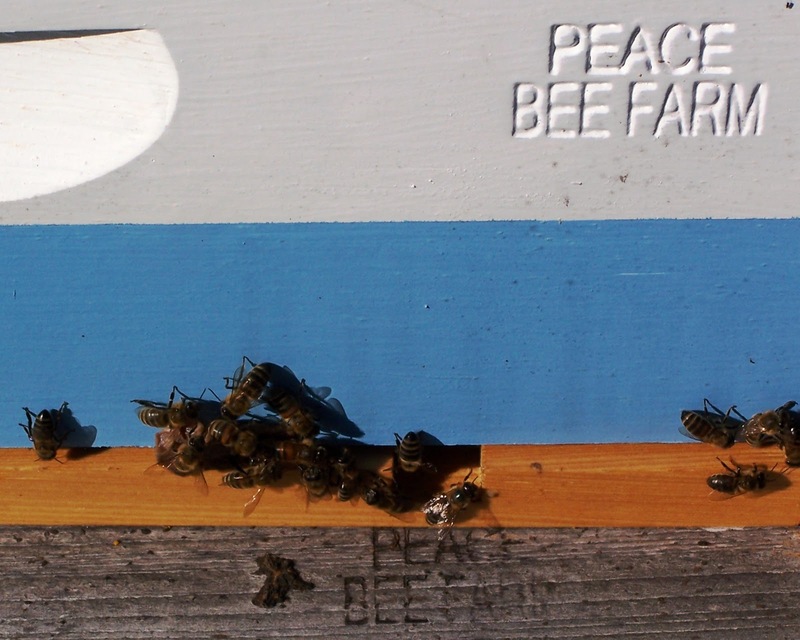 Peace Bee Farm is proud that Kat offers our honey at Muddy’s Bake Shop. The Flyer describes these under-30s as “intensely creative and highly engaging.” We agree. The honey bee has been compared to the coal miner’s canary. Coal miners used the fragile birds as indicators of the condition of mines. As long as the canaries could breathe the mine’s air and continue singing, the atmosphere was considered safe enough for the miners to breathe. The death of the canary meant that the mine was in trouble. The death of honey bees may indicate that the environment is in trouble. Beekeepers experienced heavy losses of colonies throughout the Mississippi River Delta region this past summer. During a summer that set records as the hottest in recorded history, pest insect populations exploded in the Mississippi and Arkansas Deltas. Army worms and soybean loopers covered cotton and soybean plants, often stripping the plants of leaves. In response, growers sprayed broad-spectrum insecticides on these plants, which are highly attractive to honey bees and other pollinators. Broad-spectrum insecticides kill all insects, including beneficial pollinators, not just the targeted species. Some of the sprayed pesticides are considered persistent, meaning that they remain in the environment for a long time. For the honey bees, the summer-time insecticide sprayings were particularly damaging. Many of the crops sprayed with insecticides for the summer’s break-out of insect pests had previously been treated with systemic insecticides. Here, insecticide-coated seed poisoned the entire crop plant. Honey bees cannot detoxify multiple toxins in their bodies. With their immune systems severely damaged, the bees were attacked by multiple pathogens: bacteria, viruses, and funguses. Sick bees left the hives to die without contaminating the colony. Bees disoriented by neurotoxins were unable to navigate back to the hive and died. The spraying of broad-spectrum insecticides in the summer resulted in heavy losses for the Delta beekeepers. Native pollinators were surely decimated as well. Continuous use of pesticides results in replacement of pest populations with new, chemical-resistant pest populations. 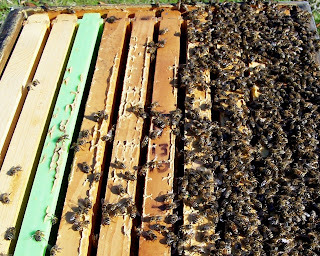 My queen evaluation bee yard, shown dusted in light snow, lost more than one fourth of its colonies of workers, drones, and queens. Today, I am preparing the frames to hold the honey that the bees will be making six months from now. In the temperate zone, the honey bee colony follows a pattern throughout the year based upon the length of the day, the weather, and the flowering plants. 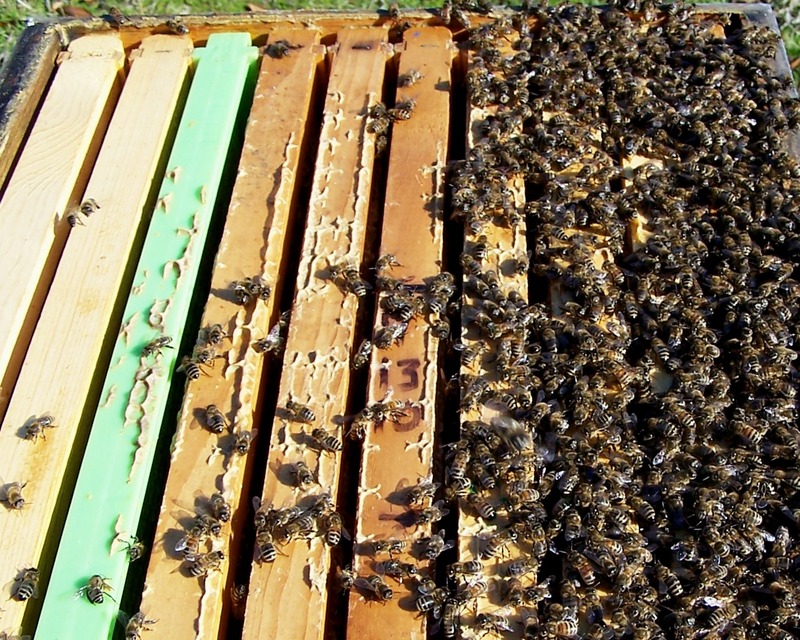 To manage the colonies, beekeepers must be prepared for a series of changing events. There are no bees flying today; they’re clustered together inside the hives for warmth. The winter survival of bees in managed hives is largely dependent upon the actions of their beekeepers in late summer and throughout the fall. If the hives have adequate ventilation and enough food located close to the winter cluster where the bees can access it, then they stand a good chance of living until the weather warms and flowers start blooming. While it is important to always be considering the bees’ future needs and planning for equipping the hives as needed, not all actions are taken so far in advance. There will be plenty of opportunities for the beekeeper to check on the hives and take corrective actions. An occasional warm day later in the winter will allow me to peek briefly inside the hives and see if any of the colonies are running short of food. If so, some emergency feeding can usually carry the bees through the end of winter. 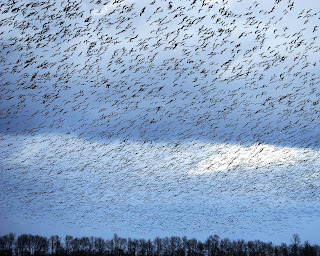 Click on today’s photo of a large flock of snow geese in the Arkansas Delta. These winter-visiting birds employ an effective scheme of surviving the changing seasons by migrating many hundreds of miles from their arctic breeding grounds to feeding grounds beyond the snow-covered regions. For protection from predators, the gregarious birds congregate in large numbers. 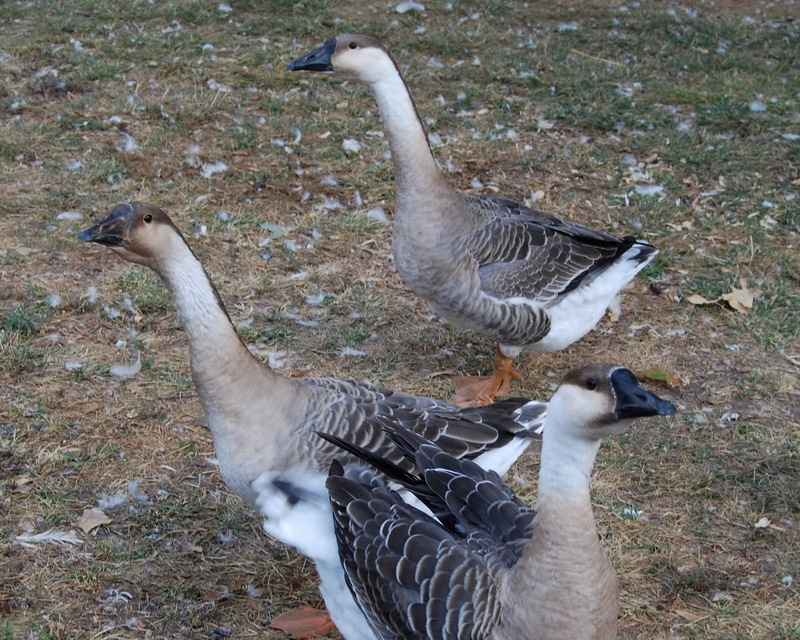 Half of the birds are white with dark wing tips; the other half is a dark color phase of the same species known as the blue goose. When the birds are feeding in an open Delta field, the ground takes on the appearance of dirty snow. With the ground covered in snow and large flocks of snow geese passing low overhead, it’s a good time to start thinking about spring-time flower planting. The Great Sunflower Project is an enjoyable outdoor pastime that gathers important pollinator population data. The project provides an opportunity for anyone in North America to participate as a citizen scientist. The purpose of the Great Sunflower Project is to locate and count honey bees and native pollinators across the United States and Canada. The project, lead by conservation biologist Dr. Gretchen LeBuhn of San Francisco State University, is measuring the bee populations across urban, suburban, and rural areas. The study is also intended to determine the condition of native pollinators, which have not been measured on a large scale. The study seeks to find out how changing pollinator numbers affects garden plants, crops, and wild plants. The method is simple: everyone participating plants the same variety of sunflower, Lemon Queen; then they count the bees that come to the flowers of a single plant in 15 minutes. Sunflower garden locations are mapped, and bee sightings are recorded. Lemon Queen is highly attractive to honey bees as well as other bees and pollinators. I have observed honey bees, blue orchard bees, bumblebees, carpenter bees, leaf cutting bees, and numerous other pollinators on my sunflowers. Today’s photo from late September shows a honey bee collecting sunflower pollen. The project currently has 90 thousand people participating across North America. The value of the data collected increases with the number of people participating. On average, the citizen scientists are reporting seeing a bee every 2.6 minutes. Twenty percent of the sunflower gardens have no bees at all. This negative result is an important finding. 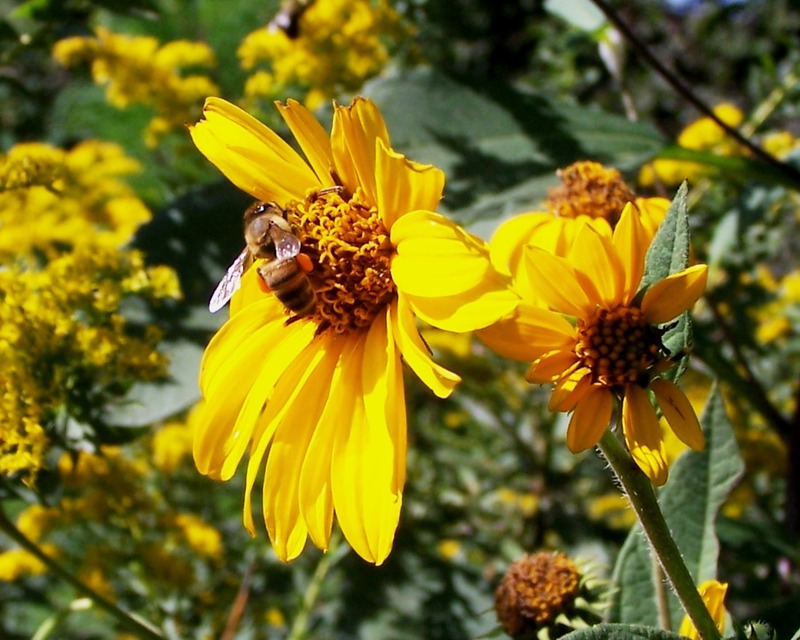 You may participate in this worthwhile study of pollinators by logging onto http://www.greatsunflower.org/. Buy a package of Lemon Queen sunflowers, and then wait for the snow to melt, the snow geese to migrate back to the arctic, and the soil to warm. Whenever weather conditions allow honey bees to fly from the hives, scout bees go looking for available nectar and pollen. A warm day in early January finds worker bees making cleansing flights and a few scouts searching for food. Without flowers in bloom, the scouts converge on the food bowls of our domestic chickens, ducks, and geese. 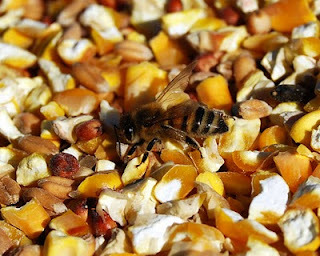 The bees detect the grain dust in the feed comprised of cracked corn, wheat, and grain sorghum as being granules of pollen. Within minutes, the scouts convey their findings to long-idle foragers. Soon, each food bowl holds dozens of worker bees. The bees roll and tumble across the surface of the grain, covering their hairy bodies with dust. They pay no attention to the geese gulping the grain. Periodically, the bees stop and groom their bodies using the rakes and combs on their legs to gather the dust into pellets which they form by mixing granules of dust with honey that they carry in their honey gut. The worker in today’s photo carries pellets of grain dust on her hind legs. Honey bees cannot determine the quality of the pollen that they collect. When pollen is not available in great quantities or from diverse sources, the bees may gather food of lesser nutritional value. Indeed, today the bees are not even gathering pollen; they are mistakenly gathering another product of a similar size and texture. Honey bees often mistakenly bring powdered insecticides, fungicides, and other small-particle chemicals back to the hive. Pollen provides the honey bees protein, fats, vitamins, and minerals. The dust from the poultry feed probably provides the bees some nutrition. The sight of the bees actively foraging in the grain tempts me to put out some pollen substitute, but I feel like the time is too early. When the bees start bringing pollen back to the hive, it will stimulate the queen to start laying eggs. We still have too much winter facing us to stimulate the hives now. The honey bee genome project told us that honey bees have fragile immune systems with fewer genes associated with their immune system than many other insects. With the individual bees slightly protected, it seems that the honey bee evolved a number of behaviors to protect the health of the colony as a whole. On a warm winter day, with temperatures rising slightly above 50 degrees Fahrenheit, the bees leave the hive to make cleansing flights. Honey bees keep a clean nest, and they never defecate inside the hive. Today’s picture shows honey bees returning to the hive’s entrance, reduced to a small opening for the winter. Occasional warm days allow the bees to leave the hive briefly and reduce the effect of Nosema disease. Other colony health behaviors include the protection of the hive by guard bees, and workers’ removing dead bees from the hive. An important behavior for the protection of the colony involves sick or diseased bees leaving the hive to die, thus not spreading pathogens to healthy bees of the colony. The absence of sick or dead bees has made the study of Colony Collapse Disorder even more difficult. We are learning more about the mechanisms involved in the spread of Colony Collapse Disorder. Searching for the causes of CCD and its breadth, researchers are looking into the health of native pollinators as well as honey bees. Like the honey bees, a number of these native insect species are declining. Rajwinder Singh, et al reported in PLoS ONE, December 22, 2010, on their investigation into bumblebee health. The report can be read at http://www.plosone.org/article/info:doi/10.1371/journal.pone.0014357. Singh found that bumblebees can carry viruses normally found affecting honey bees. The investigators found that the viruses are transported between the different insect species in the pollen that they collect. Over time, we will learn much about the relationship between the honey bees, the other pollinators, and the environment. This mechanism of transmission of viruses is a key part of the unraveling story. Through photosynthesis, plants convert solar energy into carbohydrates forming the basis for a food chain that sustains all living creatures. Agriculture provides our most efficient usage of solar energy, and the honey bee is an integral part of agriculture. Without the bees and other pollinators, the diversity of plant life and food for wildlife, livestock, and humans would be greatly reduced. The January 2011 issue of National Geographic features in-depth coverage of the planet’s expanding human population, which is expected to reach seven billion this year and nine billion by 2045. The rapidly growing population will make an increasing demand upon the earth’s resources. The future will see increasing challenges in feeding the world. A New York Times article describes some novel, sometimes whimsical, approaches to solving two of our challenges: obtaining food and controlling invasive species. As food for thought, literally, the author challenges us to find ways to reduce the invasive plants and animals by finding ways to make them desirable food choices. He describes how chefs in the Florida Keys are preparing invasive lionfish and Chicago chefs are cooking invasive Asian carp. Individuals in other parts of the country are anticipating an abundance of invasive members of the mustard family in the spring. The incredibly fast-growing kudzu vine, an invasive legume imported to control soil erosion, is known as a food source. While these plants are considered a nuisance to some, they are important bee plants, producing both nectar and pollen. I have eaten delicious kudzu honey produced in Mississippi. The Times piece, “A Diet for an Invaded Planet: Invasive Species,” can be read at nytimes.com/2011/01/02/weekinreview/02gorman.html?_r=1&hpw. Many people enjoy eating wild game. A number of states have programs that provide venison donated by hunters to feed the needy. A generous friend recently donated a flock of geese to provide sustainable nutrition for a distant family through Heifer International. Visit http://www.heifer.org/ to learn about their programs. Today’s photo: gently, domestic Toulouse geese noisily greet Peace Farm visitors. 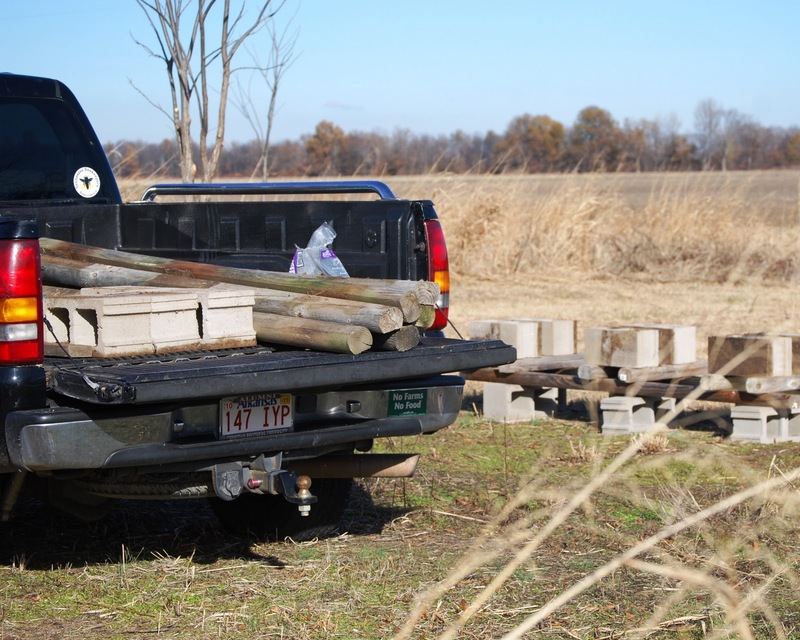 Cold winter days are good times to work around the bee yard without disturbing the bees. The honey bees remain clustered inside the hive whenever the temperatures are below 50 degrees Fahrenheit. As long as we don’t open a hive or strike one, the bees will remain inside, allowing us to safely do certain tasks that may be much more difficult when the bees are active outside the hives. It may be necessary to move a bee yard. Beekeepers should pay attention to the performance of each bee yard. A significantly reduced honey crop or a large number of colony losses may indicate that external factors are affecting the hives in this bee yard. Honey yield and colony health are greatly affected by agricultural practices on surrounding farms, and by horticultural practices of nearby communities or golf courses. Farmland may change in use according to crop rotations. Crops like soybeans, alfalfa, and cotton that produce nectar may be replaced by rice, corn, or wheat that produce no nectar. Farms, suburban lawns, and golf courses are capable of overusing pesticides dangerous to honey bees. If one decides that it is important to move a bee yard, the hives can usually be lifted by two people. The hives usually weigh considerably less in the winter than at other times of the year. Simply place a strap around the entire hive to hold the hive bodies, bottom board, and cover in place; and lift the hive as a unit. The entrance may be blocked with foam rubber. Other winter bee yard tasks can include repairing damaged hive stands, cutting brush and limbs, and making changes to improve beekeeper access to the hives. 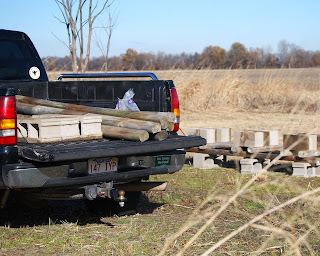 Recent cold days gave me the opportunity to build additional hive stands in a distant bee yard to accommodate swarms. We don’t place colonies with unknown genetics or possible diseases in our bee yards used for raising queens and drones. Extra blocks keep rails from warping before the stands are used. 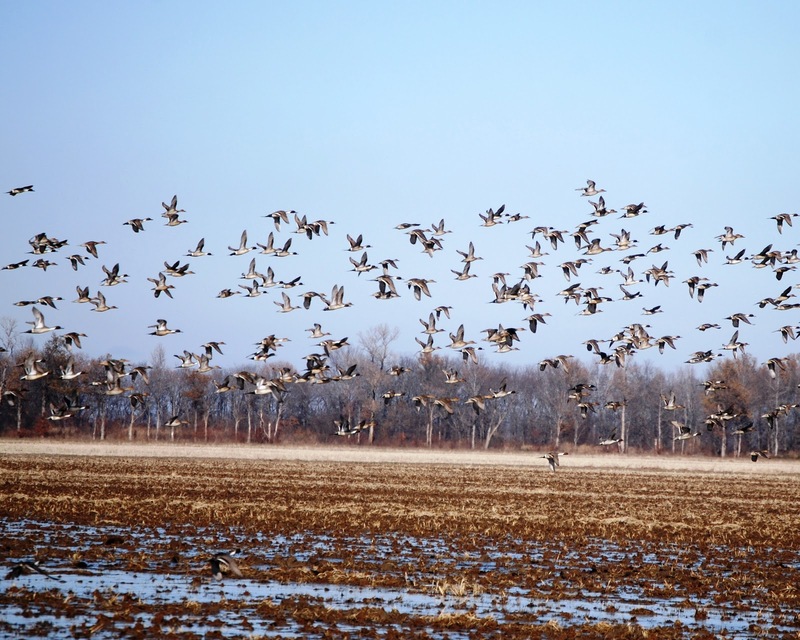 The Arkansas Delta is the winter home of many migratory birds. 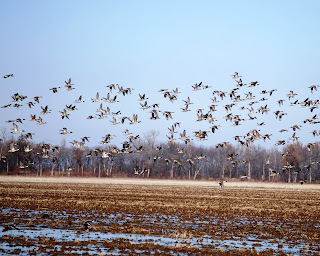 Located along the central flyway, great numbers of waterfowl from Canada and the northern United States winter in the Delta. The harvested agricultural fields offer the migratory visitors ample high-energy food, and the Mississippi River and its tributaries afford cover and protection. The temperate Arkansas Delta experiences four distinct seasons. As fall turns into winter, ducks and geese arrive in great numbers. The last week of December brought large flocks of pintail ducks, as seen in today’s photo. I encountered these puddle ducks feeding in the wet stubble of a harvested rice field near one of our bee yards. Other fields hold mallards and northern shovelers, both colorful puddle ducks. Wary wood ducks hide in tree-lined corners of lakes on our bird sanctuary. Overhead, large flocks of snow geese can be seen throughout the day. A few dozen Canada geese drop in with our domestic geese at sundown. The birds gain weight in the winter eating high-energy spilled grain, plant material, and invertebrates. The migrants are driven to the South by snow cover preventing them from accessing food. They will remain in the Arkansas Delta throughout the winter unless the surface remains hard-frozen for an extended period. Then, they will move further south. The area’s farmers welcome the migratory waterfowl; many flood fields to provide food for the birds. The birds help control crop weeds, especially red rice, by eating the seed in flooded fields. 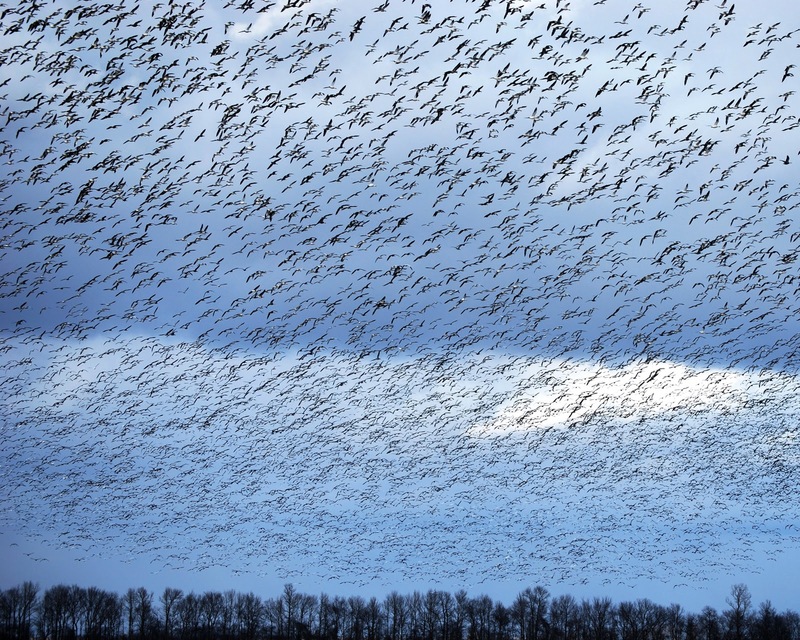 The waterfowl evolved a survival strategy based upon migrating with the changing seasons. In the fall and winter, they leave their snow-covered northern range and fly hundreds of miles to suitable grounds in the South. Some, like gadwalls and American wigeons fly early, but most wait until late. Migrating at night, they let the strong North winds of an arctic cold front carry them South, saving a great amount of energy. Meanwhile, honey bees remain inside their hives, generating warmth from high-energy honey.